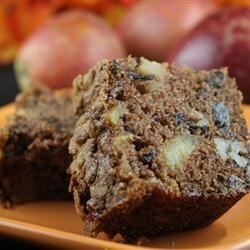 "A wonderful loaf cake that is chock full of apples. It also contains raisins and nuts." Preheat oven to 350 degrees F (175 degrees C). Grease and flour an 8x4-inch loaf pan. In a medium bowl, mix together the sugar, egg, and oil. Stir in the flour mixture just until combined, and fold in the apples, nuts, and raisins. I made this today and I will not try this again. This is an easy, tasty recipe. I replaced white for whole wheat flour and used the new Splenda/sugar baking combo. It was a pretty darn good loaf cake for a diabetic.